Spectacular views of Cascade mountain peaks, abundant wildlife, and some of the best fly fishing in the Northwest make Davis Lake a popular place to visit. A popular fly fishing only lake with plenty of rainbow trout and largemouth bass. Several miles southwest of Bend, Davis Lake is located just south of South Twin Lake via the scenic Cascade Lakes Highway. Several trails near the lake offer beautiful scenery and spectacular views for hikers, bikers, and horseback riders. 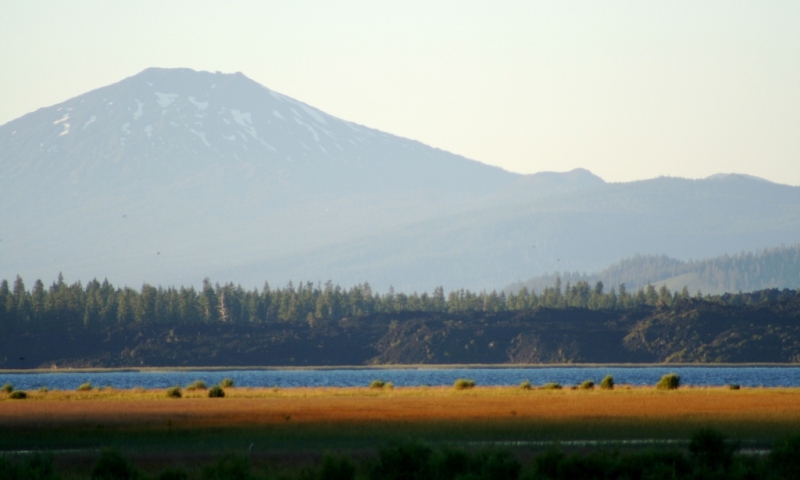 Southwest of Bend tucked away in the breathtaking scenery of Deschutes National Forest is beautiful Davis Lake. With an abundance of largemouth bass, whitefish, and trophy-sized trout, fly fishing is the only type of fishing allowed at this 3,000 acre alpine lake. Hiking, biking, horseback riding, camping, and snowmobiling are also popular activities around Davis Lake. The area is also rich with wildlife. As many as 50 different species of animals can be spotted near this lake in the spring, including majestic Rocky Mountain elk, American white pelicans, and black-backed woodpeckers. David Lake is located southwest of Bend, just past South Twin Lake on the scenic Cascade Lakes Highway (Forest Road 46). In the spring and early summer the road is closed to the northeast shore of the lake, as well as Lava Campground. Snow prohibits access to the area during the winter. Birdwatching – An array of beautiful birds inhabit this area, including a variety of grebes and terns, great gray owls, woodpeckers, bald eagles and osprey. Trails – There are several miles of trails near the lake offer beautiful scenery for hikers, bikers, and equestrians. These include the 6 mile Maiden Lake Trail and the 7.5 mile Moore Creek Trail. The 2.7 mile Maiden peak Trail (not open for biking) passes through lava flows and old growth forest, and provides spectacular views of the Three Sisters, Diamond Peak, Odell Lake, and Davis Lake. Snowmobiling – Forty-nine miles of trails known as the David Lake Run provide excellent snowmobiling in the winter. Davis Lake is fairly shallow with depths around 22 feet. Water levels in the lake vary significantly from one year to the next. American pika - cute little furry animals with big round ears and no tail - are often seen near the northeast shore of Davis Lake.